So, how was your Father's Day weekend? Ours involved our 6 year old being resuscitated 5 times, 4 of those we did ourselves. We had a 4am blue lighted ambulance trip and two nights in a high dependency unit. Hugh had 3 lots of midazolam, 6 double doses of clobazam, lorazepam and a loading dose of phenytoin. That's basically a whole heap of psychoactive drugs for a tiny 6 year old to take. So, probably not our best weekend. Hugh responded well to the recently increased dose of midazolam and whilst he unfortunately needed stronger drugs to stop them reoccurring, it did work to stop the individual seizure and get him breathing again. His last episode like this was back in March (coincidentally Mother's Day weekend). He failed to respond to the midazolam then (hence the increase) and we were at a very real risk of losing him. So whilst I'd rather the seizures hadn't happened at all, I'm reassured to know the increased dose of midazolam does work. Hugh's 'big' seizures are rare and life threatening. Often the only outward sign is that he stops breathing. I think the seizure activity must affect the area of his brain that controls breathing or something. It's not that he physically can't breathe effectively, as with some types of seizure, it's that he completely stops breathing- l think his brain just doesn't tell him to breathe any more. 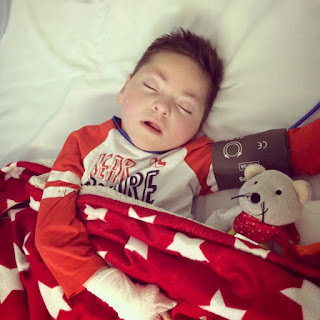 We are as prepared for this as we can be- we have a bag and mask and oxygen which we use to breathe for him (like mouth to mouth but more effective and controlled) and we have the midazolam - the drug to stop the seizure and get him breathing by himself again. Sometimes though Hugh likes to mix things up a bit and instead of lying still and unresponsive- as you might expect from someone who's not breathing- he then starts to jerk and convulse as well. This makes trying to resuscitate him extremely difficult as it is very hard to keep his airway open and get the oxygen in. In hospital there is a team of people to help- one holds his head at an angle, one holds his shoulders still, one holds the mask in place and forces the air into his lungs. At home, alone, this isn't as simple. The events in March were particularly difficult, I wasn't able to resuscitate him by myself. I've since been taught to pin his head between my knees if this happens but I've lived in fear of this reoccurring. Last weekend however, Hugh lay floppy and lifeless during his seizure. And whilst it's not a position I enjoy seeing my son in, i am grateful that we were able to resuscitate him effectively and keep the oxygen pumping round his body. Whilst I know it won't always be this 'easy' (relatively speaking) I'm relieved to know it doesn't always have to be as hard as it was in March. Hospital is often the last place we want to be, but sometimes it is the best place to be. When Hugh's seizure stopped at 4am on Friday morning, we debated whether to keep him at home. But we decided that he'd had too many seizures by this time and that he really needed to be in hospital. 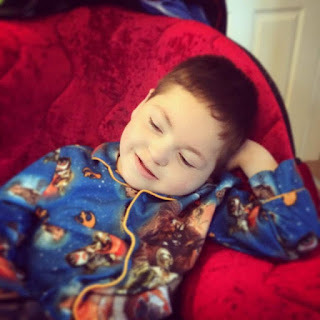 At 630am when his seizures started again, I was exceptionally grateful we'd made that call. He was exactly where he needed to be- with the highly trained staff of the high dependency unit; people who know him well and have stronger drugs than us at their disposal. Likewise, when he seemed to be recovering well and we were offered the opportunity to to go home, instead of grabbing it and running, we opted to stay an extra night to be on the safe side. 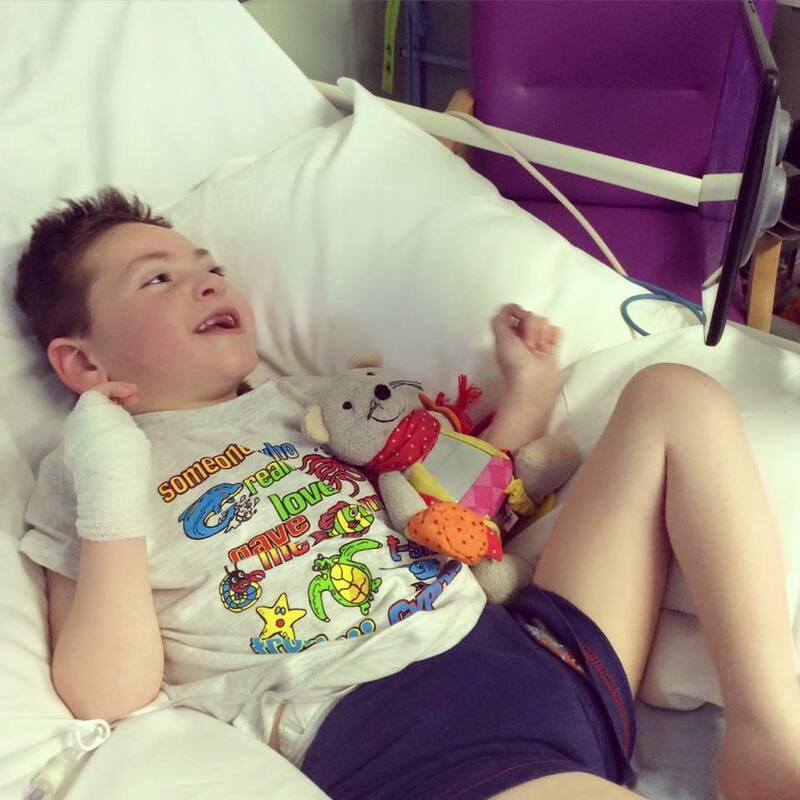 When the seizures returned and he needed more intravenous drugs to stop them, I was grateful we hadn't left hospital when we had the chance. Hugh was where he needed to be. Hugh was discharged on Sunday: Father's Day. Daddy's present was simply to have his son home from hospital. His special Father's Day dinner was a take-away pizza. It certainly wasn't the weekend we'd planned, nor one we'd hoped for. But Hugh is home, he is happy, he is well and for now, the seizures have stopped. That is certainly something to feel grateful for. Thanks Becky. I think it's helpful to always find some positives even when things are difficult. Love the while idea of Reasons o be Cheerful. Will definitely ink up again.